Alternatively, this pet can also be purchased from Blind Wunja, who is neutral to both Horde and Alliance. I see it was cageable and going for 95K on AH today - I used multiple toons to kill the 2 elites which gave 10 each then finally reaching 100 polished charms. Other 3 pets at that vendor are 100 or more of the new charms. 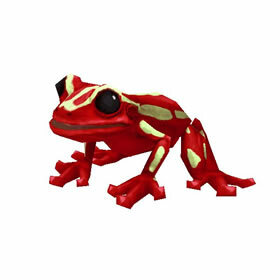 This frog's peculiar red color appears to have evolved specifically for camouflage in blood. Spooky.